The hardest thing in the world to understand is the income tax." It's on the calendar: the April 15th filing deadline for federal individual income tax. Just as a new year begins, it's tax-filing season and the frenzy begins. Some taxpayers are excited and eagerly anticipate a tax refund. Predictably, they are likely to file their tax returns early. Others are stressed and fearful of how much they might owe the government. Tax preparers are extremely busy filling out forms and filing tax returns. And on April 15th, some post offices stay open late to accommodate filers who wait until the last minute to make the midnight deadline. Why do tax forms cause such frenzy? Taxes must be paid—it's the law. Federal individual income tax must be paid to the U.S. government on all forms of annual earnings that make up a taxpayer's taxable income. Taxable income is calculated based on the taxpayer's adjusted gross income for the tax year minus allowable tax exemptions, deductions, and credits. But making the calculations and completing the forms necessary for determining taxable income can be confusing and complex! Income tax is collected by the Internal Revenue Service (IRS), a federal agency. The IRS was originally called the Bureau of Internal Revenue, but the name changed in the 1950s.2 Making the collection of the tax easier, the Current Tax Payment Act was signed into law in 1943. This law requires employers to withhold federal income tax from an employee's paycheck each pay period and send the payment directly to the IRS on behalf of the employee.3 In this way, income tax is collected on a "pay as you earn" basis. The amount withheld is determined by information the employee provides on an IRS W-4 form. This form collects information including the employee's filing status, whether married or single, and allowances that can be claimed. The information is used to calculate a reasonable estimate of the amount of income tax to be withheld from each paycheck. By January 31 of each year, employers must furnish employees a W-2 Wage and Tax Statement. This form is used by employees to complete individual tax returns. Among other things, it includes the total amount of income earned and the amount of federal income tax withheld over the given year. Generally, if too much federal income tax has been withheld, a taxpayer will receive a refund. If not enough has been withheld, the taxpayer must pay the government the additional amount owed. The federal individual income tax is a progressive tax based on the ability-to-pay principle. A progressive tax is a tax in which higher-income earners pay a larger percentage of their income in tax than do lower-income earners. The IRS categorizes taxable income into tax brackets, and each tax bracket pays a different tax rate. To arrive at the tax rate, the taxpayer's filing status must be determined as explained in Publication 501 from the IRS. After calculating the amount of taxable income and identifying the filing status, the tax rate can be identified. 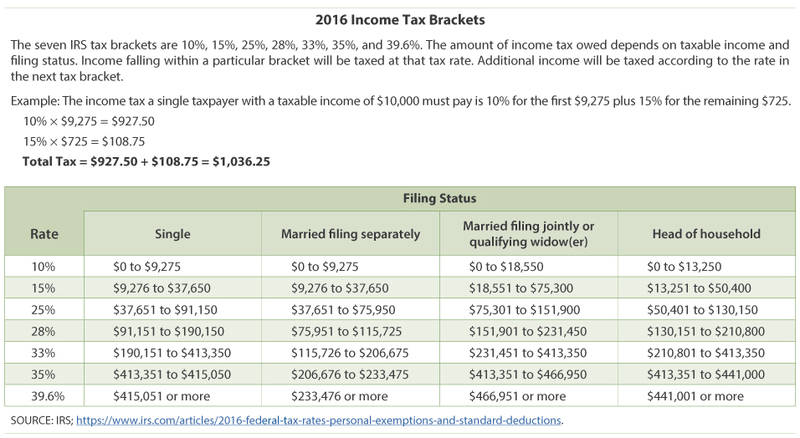 For example, for 2016, the seven tax brackets range from 10 to 39.6 percent. Without doubt, the highest income earners pay a greater portion of total income taxes collected by the IRS. For example, the top 50 percent of income earners paid 97.2 percent of all federal income taxes in the year 2013. NOTE: Original images ©Tax Foundation. 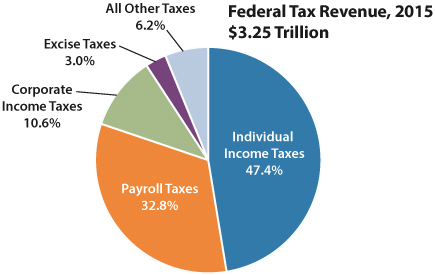 SOURCE: IRS; http://www.irs.gov/uac/SOI-Tax-Stats-Individual-Income-Tax-Rates-and-Tax-Shares. Tax Foundation. "Summary of the Latest Federal Income Tax Data, 2015 Update." November 19, 2015; http://taxfoundation.org/article/summary-latest-federal-income-tax-data-2015-update. SOURCE: Office of Management and Budget. Historical Tables 2.1 and 2.2. Accessed October 26, 2016; https://www.whitehouse.gov/omb/budget/Historicals. The U.S. government collects trillions of dollars in revenue from several types of taxes and fees. Of all the federal taxes and fees, the individual income tax is the largest revenue source. For example, in 2015, it was $1.54 trillion and nearly half of all tax revenue collected.4 Congress and the president determine how this tax revenue is spent. The revenue allows the government to operate and provide goods and services for citizens, such as roads, bridges, national parks, education, research, and national defense. The majority of tax refunds are due to taxpayers having paid the government more than they actually owed in taxes. When a tax return is completed and an overpayment is shown, the IRS refunds the overpayment. The government is not giving anything away—just returning money. Actually, since the government does not pay interest on an overpayment, the taxpayer is giving the government an interest-free loan out of each paycheck. 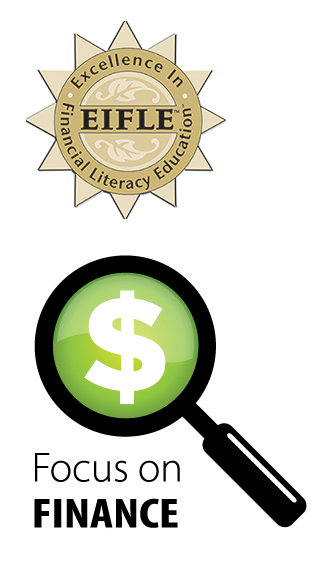 The EITC is a tax credit for low- to moderate-income working taxpayers, particularly those with children. The amount of the EITC benefit depends on the recipient's income and number of children. A tax credit directly reduces the amount of taxes owed. 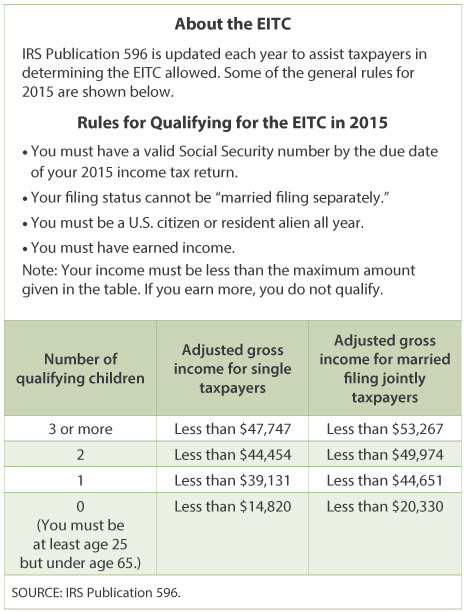 The EITC is different from most tax credits because it is a refundable tax credit. The credit can completely eliminate the income tax liability and result in a refund. For example, if a taxpayer has a tax liability of $200 and an EITC of $500, the taxpayer would be refunded the difference and receive a refund check in the amount of $300. 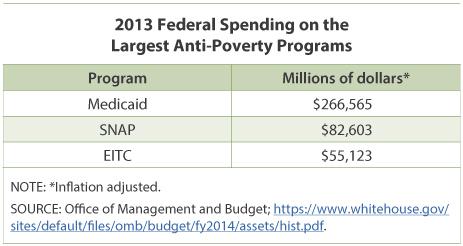 The EITC began with the Tax Reduction Act of 1975, and this anti-poverty program has expanded over the years as determined by Congress.8 The refundable portion of the EITC is classified as a spending program of the government and currently is the third-largest social welfare program in the United States. The largest two are Medicaid, a health care program for qualifying low-income individuals and those with disabilities, and the Supplemental Nutrition Assistance Program (SNAP, formerly called food stamps), which helps low-income individuals purchase food. The EITC is a benefit to taxpayers who receive it but directly reduces the amount of tax revenue for the U.S. government. 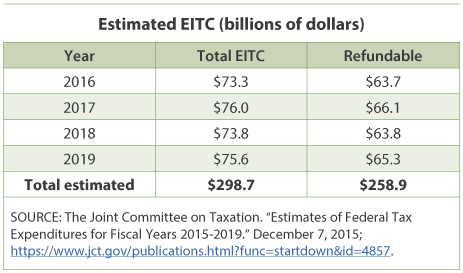 In 2015, the refundable portion of the EITC was more than $60 billion.9 Looking forward, the Joint Committee on Taxation has estimated the cost of the EITC for each year through 2019. The original income tax codes and regulations designed in 1862 took about 400 pages to describe. In 1913, the tax form was four pages and included one page of instructions.10 Today, the federal tax code is almost 75,000 pages,11 and the IRS website lists over 2,000 different forms and publications.12 The increasing complexity causes many taxpayers to rely on professional tax preparers to complete and file their tax returns. In fact, a study of the 2011 tax year shows more than half of the 145 million individual tax returns were completed by a paid tax preparer.13 With tax returns becoming longer and more complex and with more forms to file, the frenzy continues. 1 Library of Congress. "Today in History: Tax Day." Accessed October 17, 2016; https://www.loc.gov/item/today-in-history/april-15#tax-day. 2 IRS. "Brief History of IRS." Accessed October 17, 2016; https://www.irs.gov/uac/brief-history-of-irs. 3 Tax History.com. "Historical Perspectives on the Federal Income Tax." Accessed October 17, 2016; http://www.taxhistory.com/1943.html. 4 Office of Management and Budget. Historical Tables 2.1 and 2.2. Accessed October 26, 2016; https://www.whitehouse.gov/omb/budget/Historicals. 5 Sahadi, Jeanne. "Nearly 8 Out of 10 U.S. Taxpayers Get Refunds." CNN Money, January 14, 2015; http://money.cnn.com/2015/01/13/pf/taxes/taxpayer-refunds/. 6 IRS. Internal Revenue Service Data Book, 2015. Publication 55B. Washington, DC: March 2016, pp. 17 and 19; https://www.irs.gov/pub/irs-soi/15databk.pdf. 7 IRS. Internal Revenue Service Data Book, 2015. Publication 55B. Washington, DC: March 2016, p. 2; https://www.irs.gov/pub/irs-soi/15databk.pdf. 8 Hungerford, Thomas L. and Thiess, Rebecca. "The Earned Income Tax Credit and the Child Tax Credit: History, Purpose, Goals, and Effectiveness." Economic Policy Institute, September 25, 2013; http://www.epi.org/publication/ib370-earned-income-tax-credit-and-the-child-tax-credit-history-purpose-goals-and-effectiveness/. 9 IRS. Internal Revenue Service Data Book, 2015. Publication 55B. Washington, DC: March 2016, p. 19; https://www.irs.gov/pub/irs-soi/15databk.pdf. 10 Chamberlain, Andrew. "America's First Income Tax Form." Tax Foundation, July 7, 2005; http://taxfoundation.org/blog/americas-first-income-tax-form. 11 Russell, Jason. "Look at How Many Pages Are in the Federal Tax Code." Washington Examiner, April 15, 2016; http://www.washingtonexaminer.com/look-at-how-many-pages-are-in-the-federal-tax-code/article/2563032. 12 IRS. "Forms and Publications." Accessed October 19, 2016; https://www.irs.gov/forms-pubs. 13 McTigue, James R. Jr. "Paid Tax Return Preparers: In a Limited Study, Preparers Made Significant Errors." GA0-14-467T. Washington DC: April 8, 2014; http://www.gao.gov/assets/670/662356.pdf. Adjusted gross income: Gross income minus specific adjustments. File (a tax return): To mail or electronically transmit a taxpayer's income and tax liability information in a specified format. Gross income: The total amount earned before any adjustments are subtracted. Income: The payment people receive for providing resources in the marketplace. People also earn income in the form of rent, profit, and interest. Income tax: Tax on income, both earned (salaries, wages, tips, commissions) and unearned (interest, dividends). Income taxes can be levied on both individuals (personal income taxes) and businesses (business and corporate income taxes). Revenue: The income received by government from taxes and other nontax sources. Tax credit: An amount directly deducted from the total tax owed. Tax deduction: A fixed amount or percentage permitted by taxation authorities that a taxpayer could subtract from his or her gross income to reduce taxable income. Taxes: Fees charged on business and individual income, activities, property, or products by governments. People are required to pay taxes. Tax exemption: Amount allowed by the IRS that can be deducted from taxable income to reduce the amount of income tax owed. There are two types: personal and dependency. The personal exemption is for the taxpayer; the dependency exemption is based on the number of dependents the taxpayer has. The exemption amount is a set amount that changes from year to year. How Does Networking Affect Your Job Search?